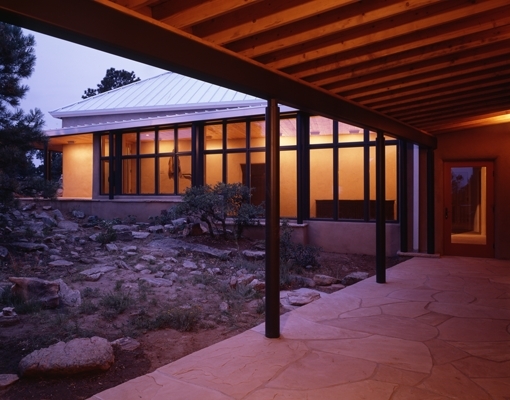 This House received a 2002 MERIT AWARD from the New Mexico Chapter of the American Institute of Architects. Located between the Rocky Mountains and the Great Plains, this house is inspired by the special quality of being “in-between” these two geographic features as well as by considerations of topography, vegetation, sun, and wind. Built for a Chicago family on their ranch near Romeroville, New Mexico, the design also responds to the special needs of one child who is confined to a wheel chair by providing a uniform floor level throughout the house. The design is a dance between human, house, and landscape. The entry is oriented along a view axis to Hermit’s Peak and is choreographed around this view. One enters along a covered walkway in-between the two-story bedroom / library area to the west and the long one-story living / dining / cooking area to the east. The front door occurs precisely at the moment in-between these two parts of the house when the view opens to the full splendour of the landscape. As one walks down into and diagonally across the entry hall towards the living room the view to Hermit’s Peak changes position within the frame of the picture window.